SharePoint Usage Survey 2017 - Workflows and Business Processes. Since 2014 Prof Arno Hitzges and Wolfgang Miedl have published 3 SharePoint surveys about the usage of Microsoft products in the DACH region. This year they published a special survey covering the usage of business processes and workflows in combination with SharePoint. As this survey is only available in German, we decided to give a general overview of their topics and findings in English. Hitzges and Miedl decided to do a more specific research on workflows and business processes as the focus of the market is more and more shifting away from simple document management systems to more complicated solutions. The last survey from 2016 already showed the growing interest in digital supported business processes and the lack of solutions for these needs. Microsoft provides the basic tools for automation and process support with the built-in workflow enhancements since SharePoint 2007. However, the capabilities of this tool remain very limited today, so that many companies either program their own extensions or look for professional alternatives in the growing market of workflow and process tools. The needs of users, their expectations of the manufacturers and the opportunities for established and new providers are examined by the present study. The aim was to provide users with more transparency and to help them deal with the topic. Which SharePoint version is your company currently using? The biggest change to the previous studies is the percentage of companies using SharePoint Online. In 2016 only 13% of the interviewed companies used Office 365. How do you host your SharePoint? This means that the DACH region is still rather conservative. Important in this case: Hosted means Online and SharePoint Server means provided by a third party. But there is change, even when it doesn’t look like it! Smaller companies with up to 200 employees start to migrate to Office 365. 34% of all Office 365 Users in this survey worked for a company smaller than 200 employees. But this doesn’t mean that bigger companies don’t think about migrating their systems to the cloud. Almost every bigger company that took part in this survey had pilot projects or running test systems on Office 365. Process management or business process management (BPM), includes the identification, design, documentation, implementation and control as well as the associated optimization of processes in companies. Here, not only technical issues, but above all organizational backgrounds, such as the organizational culture, the strategic orientation or the involvement and leading of all process participants are considered. Every company is unique and each company has its own unique processes that help differentiate and gain advantage over competitors, and ensure the company's business success through the efficient use of operational resources. A workflow is a sequence of actions in an organization. In contrast to the business process, detailed value is placed on the operational level, as the workflow descriptions divide the process into components that are unique at the IT level. The support of various applications and databases should help to use workflow models and ensure the organization's workflows. Using a workflow management system, business processes can be analyzed and designed. Simultaneous and sequential processes such as roles, tasks, conditions, times and relationships are coordinated in this way. The idea of SharePoint as a universal, enterprise-wide portal implies, in addition to the central portal concept, that employees can access the most diverse processes via one central location. Important business processes should be able to be mapped and provided via this hub. SharePoint comes with two things: First, it includes a simple workflow engine and designer to set up basic document workflows. On the other hand, there are many interfaces to all conceivable business applications, such as reading and writing data from, for example, SAP and other leading business systems. Over 50% are already using workflows to depict their business processes on SharePoint. 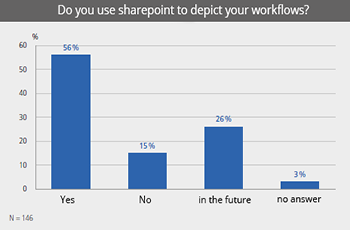 The survey shows that workflows and business processes are among the most important topics in the SharePoint universe. So, on one hand it is important to deliver an extensive engine to configure these workflows and enable companies to make their processes visible. On the other hand, business processes are almost as important as workflows. They need to be easily configurable and intelligent. For modern companies they should precalculate fields in forms, work with aggregation and metadata inheritance, and most of all, be user friendly. Today's companies should visualize their processes and structure their data in a modern and easy way. Only a combination of both makes SharePoint a tool that can be an end-to-end business platform.